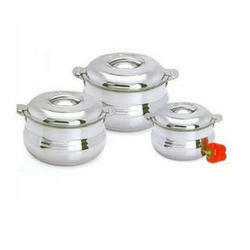 We are manufacturing a wide range of Steel Hotpots. We take pleasure in introducing ourselves as one of the leading organizations, engaged in offering a comprehensive range of Stainless Steel Hot Pot Casserole. We offer this casserole to the clients at market leading rates. 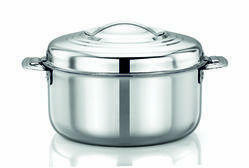 We are Exporter of Steel Casserole. - Made from High quality non-magnetic stainless steel. - Double wall Body & High quality insulation keeps your food hot for a long time. - With unique S.S.Locking system. - Available in 2.5 & 3.5 liters in 2 different shapes. We have been engaged in offering to our patrons Steel Casserole.